So, some background story- I went to a microbrewery here in Normal, Illinois. The burgers were really good, the buns were made in house, the cook did excellent work toward ‘medium-rare,’ plus it was served with fries that were identifiably part of a sweet potato. All pluses! Curiously though, the real standout was the pickle slice on the burger. It was crisp! I have never had an actually crisp (fresh) pickle. The store-bought jars claim to crunch, but that’s pretty much blatantly a lie, they’re soggy and close-to-gray. So, as a lover of the small touches, I set about searching for a good pickle recipe I could replicate with what I had in my kitchen- trouble was, I couldn’t find one. Pickling, like brewing, can be an intensely complicated process with specialized equipment, if you want it to be. You can ferment pickles, boil/blanch them, douse them in exotic spices and vinegars and any number of other complicated moves to brew sophisticated pickles. Who knows, maybe that’s exactly what this brew house did- I don’t know if I could taste the difference. I set about making a recipe which worked, with no special equipment, with foods that I had in my kitchen. Here is my thought process: to pickle a pickle, you need to create an environment that bacteria will really hate. Bacteria don’t like salt and they don’t like acids like vinegar- particularly bacteria that might make a person sick. So, salt and vinegar are the name of the secret sauce! Spice as you like, but it’s not mandatory. There are two methods here- pretty easy, and crazy easy instant pickles. Make a brine for your pickles out of white vinegar and kosher salt, mixing about 1 cup of vinegar to 1 tablespoon of salt plus a cup of water. Boil this mixture to ensure that it’s sterile, take it off heat, and drop your sliced pickles into it- either spears or hamburger slices work 🙂 I like mine about 1/2 inch thick. 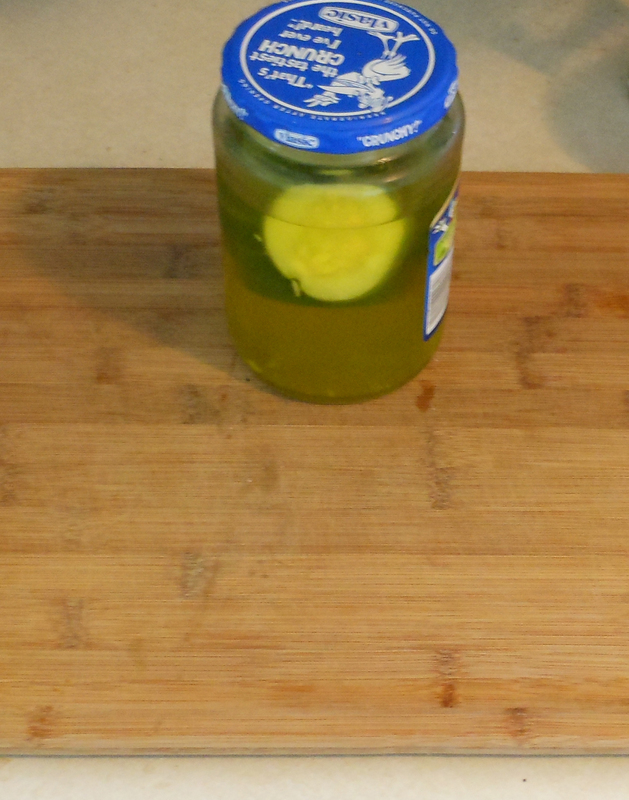 Allow the brine to cool on the stove, and fill a container (like an empty store-bought pickle jar!) with your newly minted pickles. They will last and last, at least months if refrigerated. Remember that store bought pickle container? Remember that you left it just sitting there in the fridge, bereft of pickles but full of brine? Time to recycle! 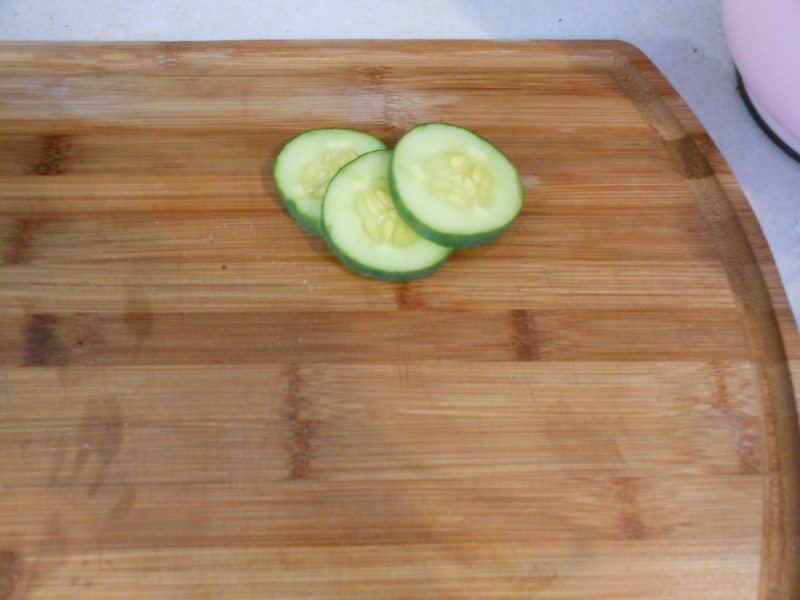 Dump a fresh cut cucumber into it, and top off with brine as described above until all the cucumbers are covered. Your cucumber will taste like pickles in about a day, and I know for a fact that they will keep for a week. I’ll update when I figure out how long they’ll last at the far end without boiling the vinegar- I’m willing to bet they will keep for a month without issue, as vinegar is a pretty fierce antibacterial. Voila! Burger bar pickles with less than ten minutes prep time :). Look at the color- this is them after a week brine, and they are as crisp and green as fresh sliced cucumbers :).